The smell of baking cookies filled the air as Nataniel helped Grandma scoop dough onto cookie sheets. Grandma smiled at him. “Who loves you?” she asked. Nataniel thought about how Grandma always made his favorite kind of cookies and kept paper on hand because she knew he liked to draw. “You do,” he answered. “Someone who loved you before you came to earth,” Grandma said. “Yes,” Grandma said, giving Nataniel a hug. He smiled. Knowing he was loved made him feel warm inside. This year in sharing time, you will learn more about the wonderful truth that you are a child of God. Heavenly Father knows and loves you. He has a plan to help you come back to live with Him someday. Fold an 8 x 8-inch (20 x 20 cm) piece of paper in half. Then fold it in half two more times. 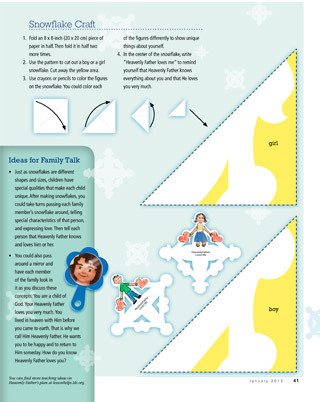 Use the pattern to cut out a boy or a girl snowflake. Cut away the yellow area. Use crayons or pencils to color the figures on the snowflake. You could color each of the figures differently to show unique things about yourself. In the center of the snowflake, write, “Heavenly Father loves me” to remind yourself that Heavenly Father knows everything about you and that He loves you very much. Just as snowflakes are different shapes and sizes, children have special qualities that make each child unique. After making snowflakes, you could take turns passing each family member’s snowflake around, telling special characteristics of that person and expressing love. Then tell each person that Heavenly Father knows and loves him or her. You could also pass around a mirror and have each member of the family look in it as you discuss these concepts: You are a child of God. Your Heavenly Father loves you very much. You lived in heaven with Him before you came to earth. That is why we call Him Heavenly Father. He wants you to be happy and to return to Him someday. How do you know Heavenly Father loves you?